A man died near Prince George’s Community College on Friday afternoon when the dump truck he was driving collided with a tractor-trailer. About 11 a.m., the dump truck driver hit the back of the tractor-trailer at a traffic signal. It appeared the bed of the tractor-trailer slammed through the dump truck’s cabin. 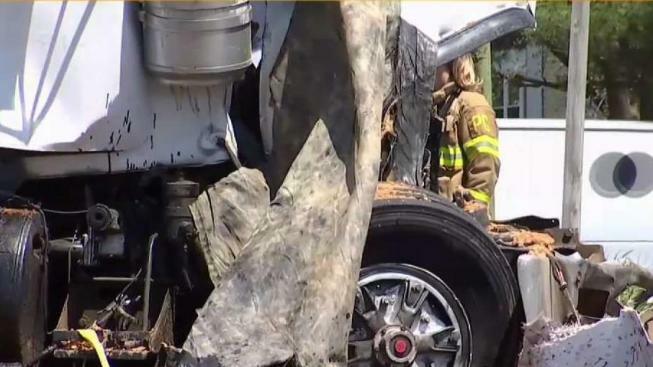 An 85-year-old man died near Prince George’s Community College on Friday afternoon when the dump truck he was driving collided with a stopped tractor-trailer, police said. The driver in the tractor-trailer, identified as 58-year old John Rejhm, was transported to the hospital with undisclosed injuries. The accident shut down parts of Route 202 in Largo, Maryland, for several hours. About 11 a.m., the dump truck carrying a load of dirt hit the back of the tractor-trailer at a traffic signal. It appeared the bed of the tractor-trailer slammed through the dump truck’s cabin. Officials said the driver died immediately. Erin Liu and Evelyn Abel witnessed the crash from a window at Prince George’s Community College culinary school. They rushed toward the dump truck and asked if the man was OK but didn’t receive a response. “We went up to the cabin to see if we could see the man in there, but we couldn’t see anything,” Liu told News4. Hazmat teams responded to the scene for fuel and oil cleanup. Route 202 reopened before 6 p.m.